2. 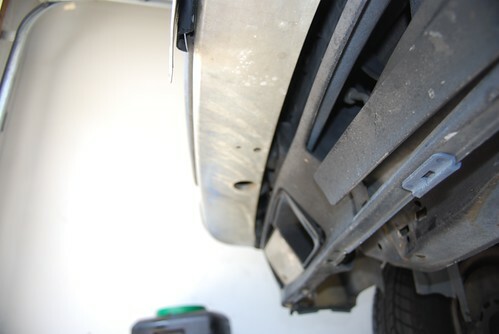 Take the Front bumper off - This is a pretty easy step, there are 2 Allen Bolts under the front bumper in the 2 holes. 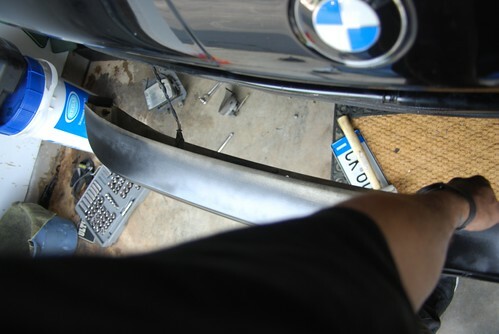 Put the wrench in and unbolt the bumper from the mounts. 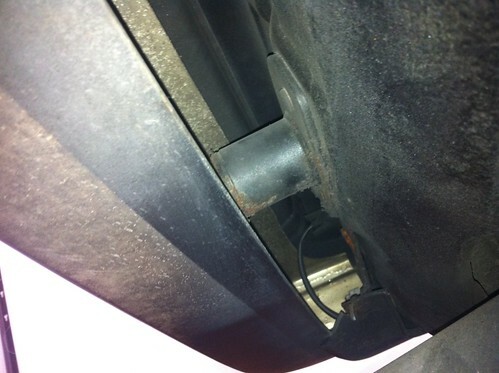 Be careful after unbolting and pulling the metal bumper away because the turn signals will still be connected. 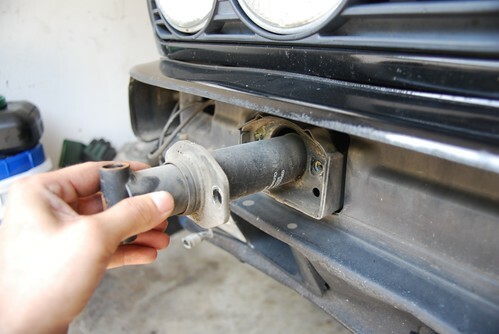 You can hold the bumper in one hand and just disconnect the connectors. 3. 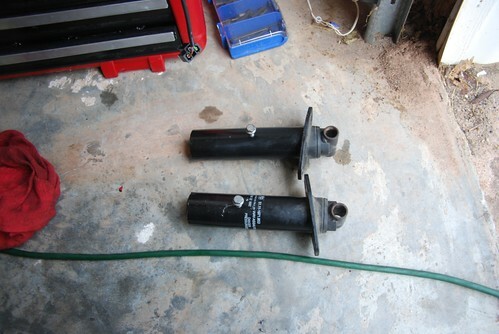 Take out the Bumper Shocks and drill them out - So there are 2 bumper shocks and these are just as easy to pull out, unbolt the 4 bolts and pull them both out. 4. 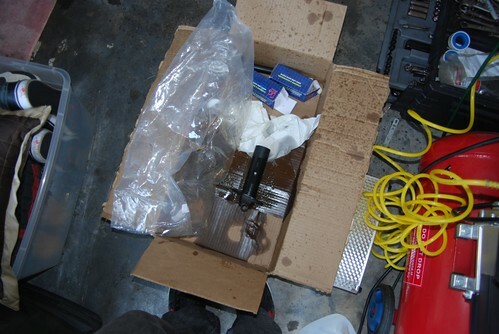 Drilling and prepping to reinstall - So now that you have them out, I set up a box with a piece of plastic over the shock in the box to prevent the fluid from going everywhere. As you start drilling you will first get a burst of fluid, then you will hit more metal and on the second burst you will get some gas. After you have drilled through both layers you can turn it over and let whatever is left inside drip out. 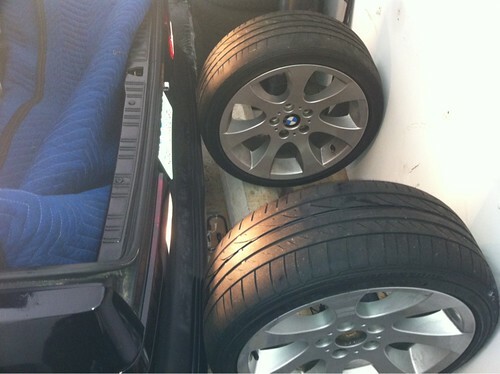 Now it is time to compress them, i am laxy so i am going to use the car as my helper. 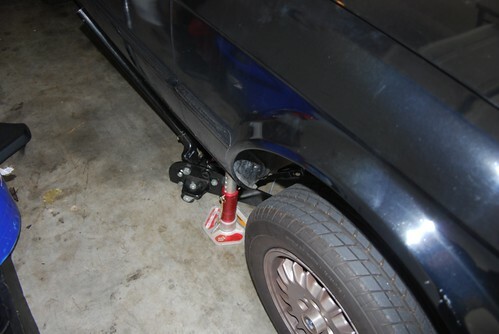 I go and take the jack and the Bumper shock and jack up against the car to compress the shock. 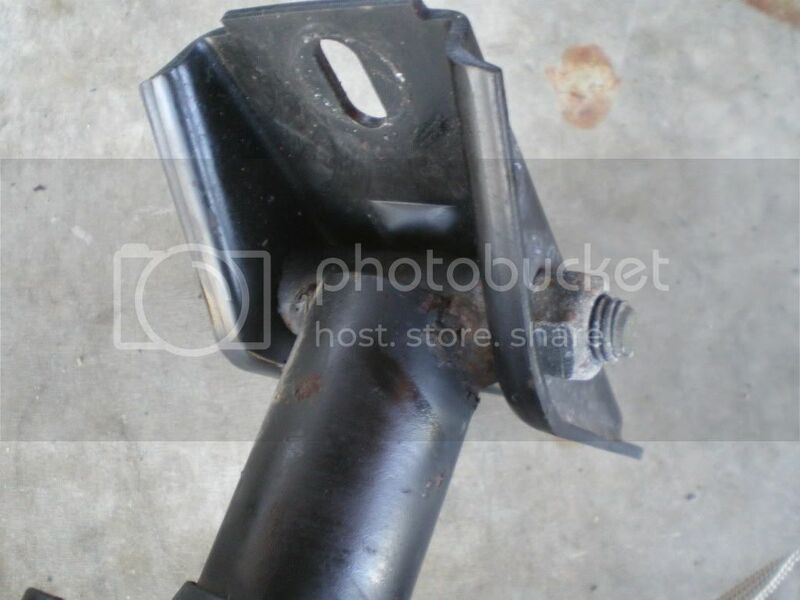 Once the shock is compressed, re drill the hole so you can put in a bolt. I recommend putting a bolt in but you dont have to. 5. 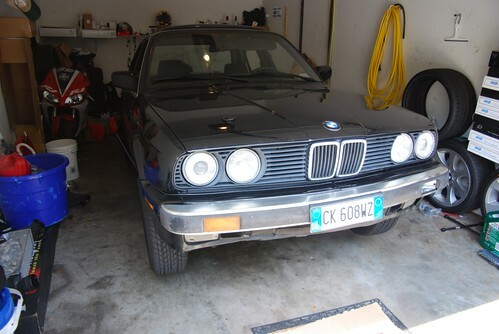 Reinstall - Just reverse the process, so i had a little issue with clearance on the driver side, but my car was in an accident so i dont know how straight that side is. I trimmed the upper cover on the inside where the bumper slides back into. A little trim and everything went back together fine. Rear Tuck: This was actually easier and had less steps, I adjusted what i had read because i was by myself and i wanted to be careful with what i was doing. 1. Jack It Up - This step should already be done because you are doing the front and the rear at the same time. Jack up the car and put it on stands. I used 2 jacks because I did this part on a different day then the front. 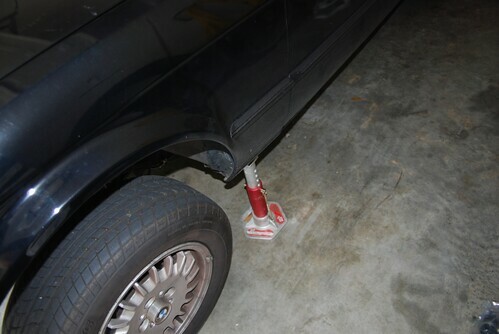 You do not need to jack up the car but it gives you some space to maneuver the drill. Im using a giant hammer drill because that is what i have but any small drill will work. 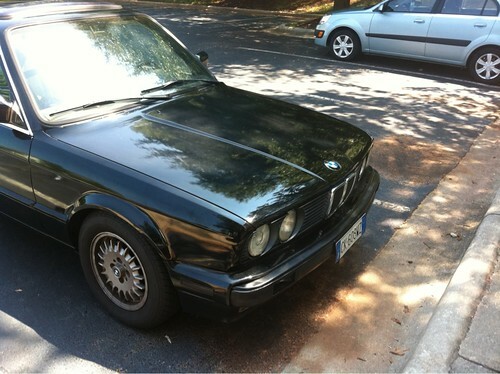 I painted the chrome before i tucked the bumper (im not a big fan of chrome on cars). 2. 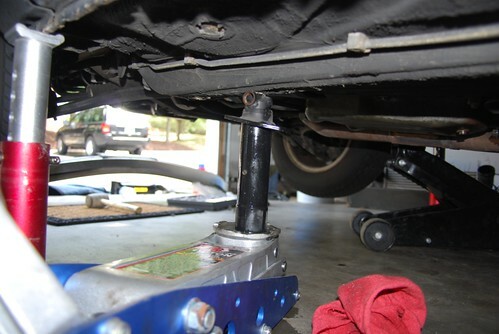 Drill Drill Drill - So now that the car is up we identify the two bumper shocks and prepare to drill. This part is a little messy but not too bad. 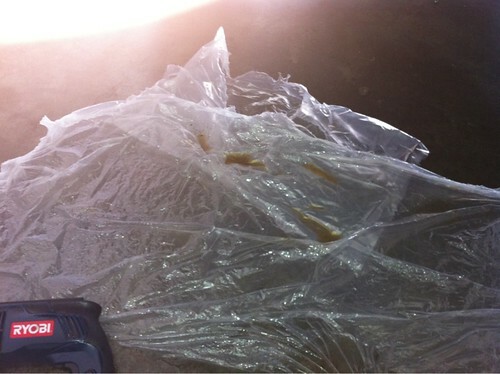 I placed some plastic on the garage floor to collect most of the fluid that is going to spray out of the shocks. Also I recommend setting up a hand washing station because I have heard of people with "sensitive skin" having a little issue with the fluid on their skin. Now that we are set up Its time to drill, I uses a smaller bit on the rear because of the angle i couldnt get a good grip, plus the dewalt drill bit was just better then the ryobi one. 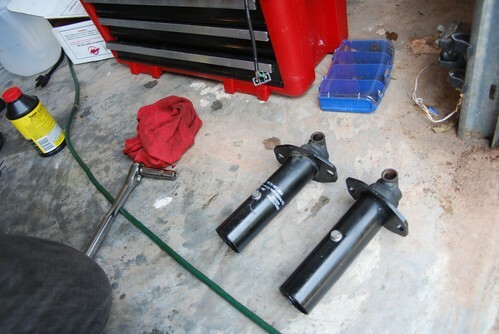 Drill the rears until you get the fluid drainage then you get the gas burst. Do this on both sides. NOTE: I recommend using eye pro while doing this so you prevent getting stuff in your eyes. 3. Press the shocks - So now we want to press the shocks in and tuck the bumper. I have seen people say just get a buddy and pull up to a wall and back into it. I was like... what? That seems weird... So i changed it a little because 1. I dont have a buddy today, and 2. im not crashing the back of my car into a wall. So, this is an optional side way of doing this part, even though.. Backing your car into a wall does, in fact, work. Lets do it a little safer. I grabbed a set of wheels with tires (they dont have to have air in them) and i put them in line with the beams in my garage. It worked out well because the shocks actually lined up with the beams in the wall. So i slowly back up the car until the bumper was pressed up against the tires and i checked. Once i was clear and ready to go, I gave it a little gas until i felt the car go back about 3 inches. Go back and check if you were really straight both sides should go in, I wasnt so lucky my driver side went in but passenger side didnt. 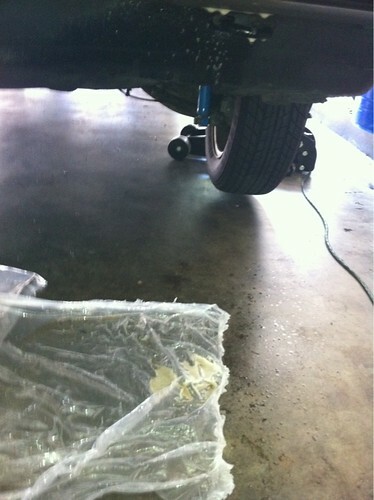 I pulled the car forward a little and removed the driver side tire that pushed the bumper in. Backed back up and pressed the passenger side in. The passenger side was a little further in so i put both tires back and pushed the driver side in to match the driver side. 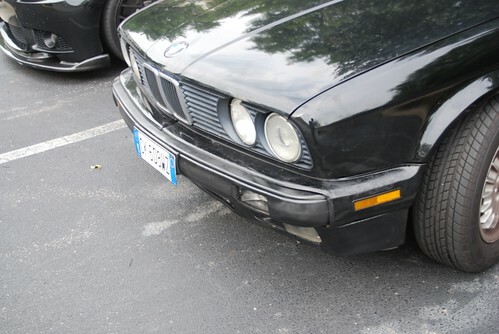 NOTE: The benefit to using rubber or the tires, is that i didnt worry about damaging my bumper at all, when i was done i took a damp rag and wiped the dirt off and there wasnt even a scuff on the bumper. 4. 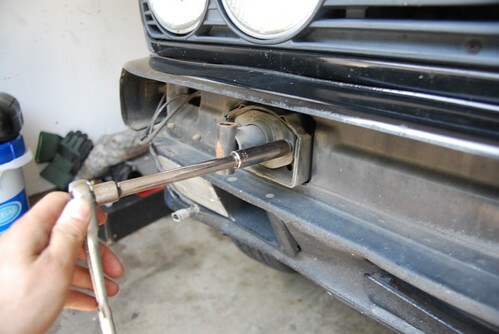 Securing the bumper - Yet again this is optional but you can re drill the holes that are in the shock, take 2 bolts or screws and lock the shocks in place. I skipped this on the rear to see if i actually do have any issues with the rear bumper moving without securing the shock. 5. Success - Now go replenish your electrolytes because if it is 1 million degrees out like it is in NC you will need it, Make sure to actually wash your arms off now that you are done to ensure you dont get rashes if you have "sensitive skin" This is a real good alternative if you are not ready to make the 450 dollar dive just to get the plastic bumpers. Last edited by dsc201knoc on Sun Aug 07, 2011 5:28 pm, edited 1 time in total. looking good, finish it up and I'll sticky it. M20_fever wrote: looking good, finish it up and I'll sticky it. Nice write-up, this is on my list of things to do once my car is actually running and I can actually worry about cosmetics. Nsquared97 wrote: Nice write-up, this is on my list of things to do once my car is actually running and I can actually worry about cosmetics. O I feel ya.. I wasn't going to do it but I had an issue where I had those two pass. side control arms so the car was jacked up I figured I would do something. Plus it gave me some time to become familiar with the front end of the car, got to see all the broke and bent stuff inside. 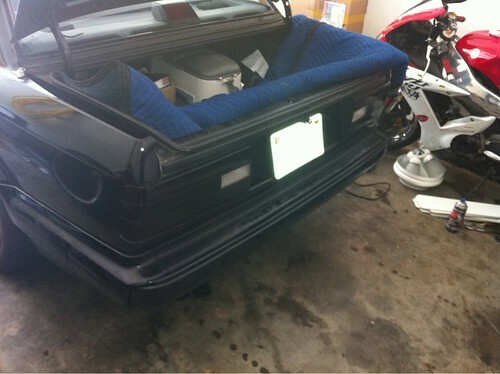 Frame is solid and straight but that valance and the lower portion of the radiator support could use some love. 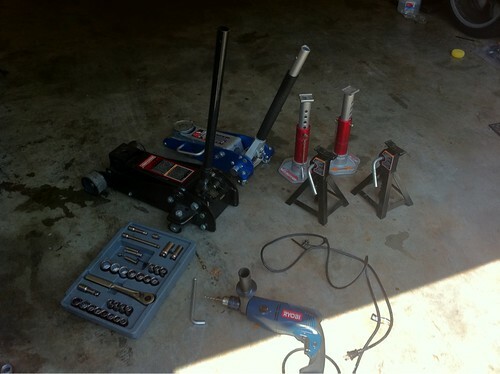 My order of business is suspension, brakes, wiring, engine, then cosmetics. 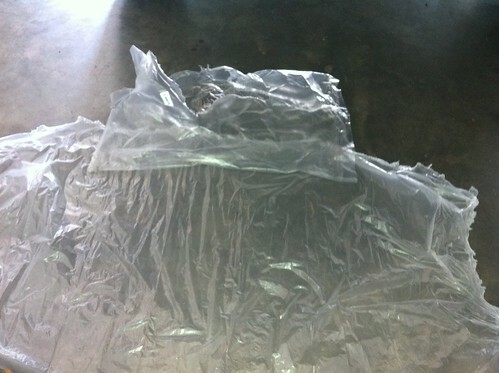 4 then mod/clean up/customize as desired. 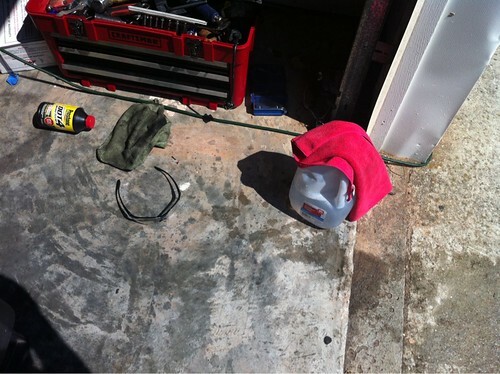 Beautiful List I am also doing all the wear items as i go, it is a headache sometimes, i like to work on cars but i hate repairing stuff that should have been fixed years ago... 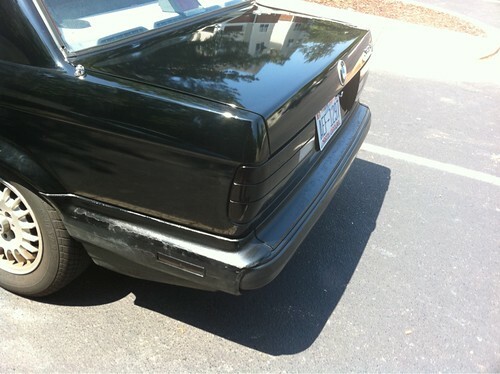 This is a good cheap way to up the appearance. Note: Finished the Howto will all info and photos posted. All it needs is side by side before and after pictures from the same angles if you can manage that. 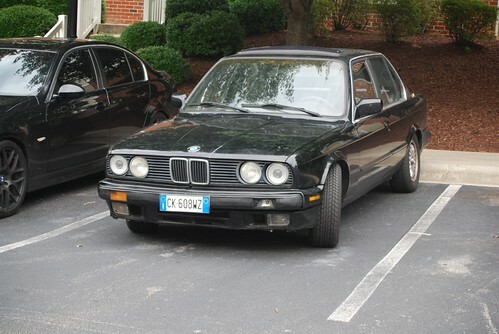 87e30 wrote: All it needs is side by side before and after pictures from the same angles if you can manage that. Just figured I would mention it, just did this on my 87 is, and there isn't a hole in the bottom of the bumper to unbolt the bumper from the shock. Nothing major, I just unbolted the shocks with the bumper still attached, but figured I would mention it. 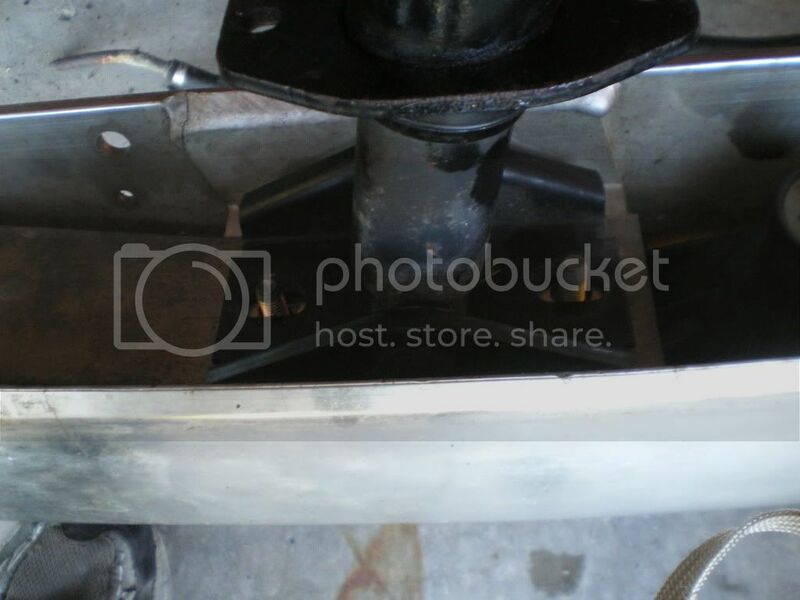 Nsquared97 wrote: Just figured I would mention it, just did this on my 87 is, and there isn't a hole in the bottom of the bumper to unbolt the bumper from the shock. Nothing major, I just unbolted the shocks with the bumper still attached, but figured I would mention it. 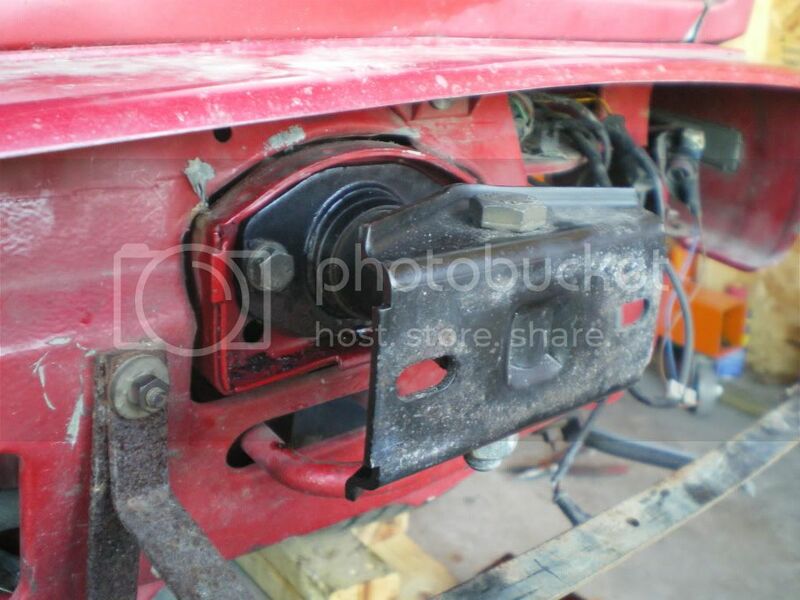 good info... Was it a pain to get it off and how is the bumper frame mounted to the bumper shock. I'll have to get a pic to show ya, but looks pretty similar to yours. Wasn't a pain to get off, but aligning everything when it went back in was. 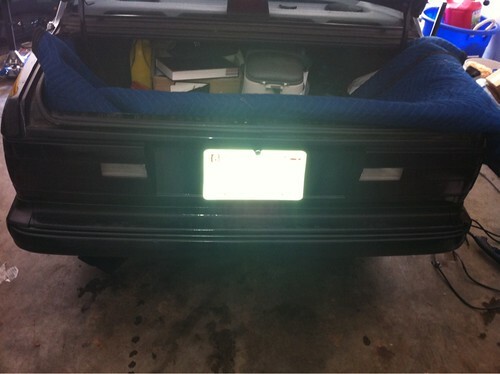 Next you can see it in place on the backside of the bumper. 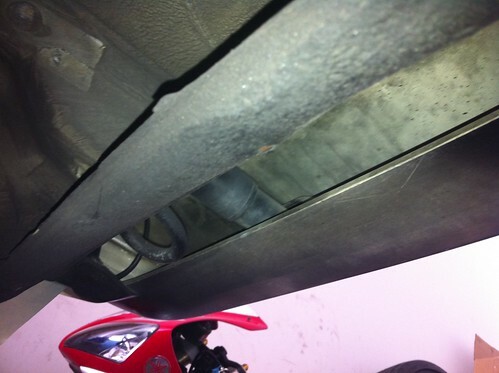 You can't really see it here, but there isn't any hole for a wrench/socket like yours has. Only reason i can think of for this is maybe the is lip would be in the way of said hole? 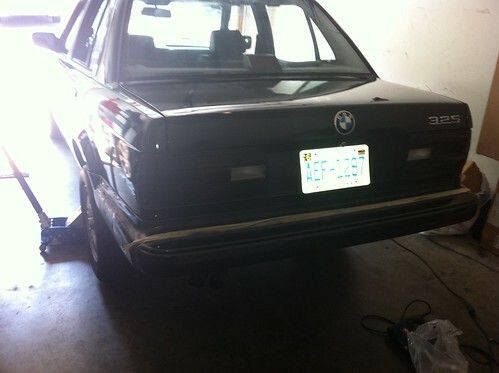 Removal: Just unbolt the bumper shocks with bumper intact from the body. 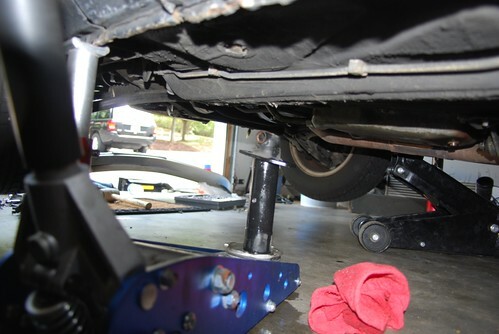 Installation: Bolt the shocks by themselves back to the body, then line the bumper up and bolt it to the shock. I found it much easier to line them up this way, all you have to do is slip the stud of the bumper through the slot on the shock, as opposed to having to try and thread a bolt into the body while you blindly maneuver the bumper to the exact orientation it needs to thread properly.